'Color A Sound' Art Installation Turns An Overhead Projector Into A Musicbox | OhGizmo! By Andrew Liszewski on 05/17/10 • Leave a comment! Built and programmed by Blair Neal as an art installation, ‘Color A Sound’ uses an overhead projector and a long roll of transparency to create a sort of manual jukebox that requires a user to essentially doodle the sheet music. 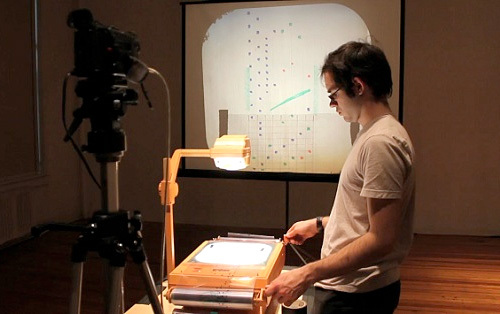 A set of colored markers are used to make lines, dots and even complex illustrations, and a camera pointed at the projected results converts the seemingly random drawings into music, playing back corresponding samples from an actual musicbox, or really any instrument including a Roland TR-808 drum machine. The manual scrolling works in both directions and at almost any speed, and until you clean the transparency, any and all musical creations are stored indefinitely.